When buying a new home, one of first things people will want to know is whether it’s north facing. Certainly, most people are drawn to natural light; in summer, when stuck in an office, we gaze longingly out of the window at the sun-drenched outdoors, and in winter we are drawn to the area of the house that lets in the winter sun. Even teenagers eventually emerge from darkened rooms in search of the light. Most of the skylights on the market today vary in size and aesthetics, depending on what your specific needs are. And, although there is likely to be one that is both pretty and practical, you need to make sure that you also consider quality. The harsh sunlight beating down on the skylight over time should in no way affect the glazing or sealing. Letting in the sunlight is all very well on clear days, but letting in the rain is the last thing you want from your newly installed skylight. Most skylights are made from glass or plastic and the quality depends on the glazing. Plastic is the cheaper choice, but it is more susceptible to the outside elements and is prone to warping, scratching and discolouring. Glass, on the other hand, won’t discolour and is generally more durable. It is, however, more expensive due to the treatment it undergoes. Tempered glass is rapidly heated and then cooled, which not only increases durability, but also improves safety as it doesn’t shatter into dangerous, sharp-edged pieces when it breaks. Laminated glass is basically a piece of plastic compressed between two pieces of glass. 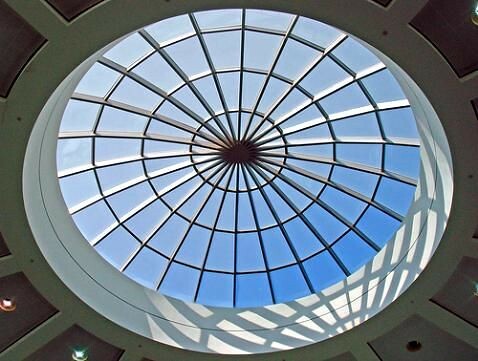 Most manufacturers build skylights using a combination of both for durability and safety. Getting expert advice on where exactly to place a skylight is essential if you want to reap maximum benefits. The angle of the roof and the direction of the sun in relation to the room are just two aspects that need to be considered. And then there is the matter of avoiding roof trusses so you don’t weaken the entire roof structure. What areas of the home will benefit the most from a skylight? These are great for a room where a big window is rarely an option. Natural light and ventilation are supplied without providing your neighbours with the view. Most often flanked with rooms or solid walls, a passageway is usually dark and unwelcoming, lit only by unnatural lighting and any lighting coming from rooms on either side. Skylights can drastically improve the light flow in a house with long passageways. Rarely are staircases lit with natural light. Installing a skylight above a staircase brightens the area and makes the stairs easier to navigate. For a variety of reasons, a room is built on to a house that can’t accommodate a window. Often, the reason is that it is built onto a boundary wall, which means that if there is a window installed, it is more for ventilation purposes than light. A skylight will make a significant difference to the atmosphere in these rooms. Have another look at what’s on offer if you imagine a small square unobtrusive window. Some skylights form part of an entire portion of the roof, offering unobstructed views and huge amounts of light; others are three or four squares lined up to create an interesting slatted effect often used in a passage, both offering a great natural decorative lighting as well as opening up the space. These days, there is tremendous variety when it comes to skylights, so consider your needs and your options carefully before making a purchase. Tracey Walker studied interior design and worked in the retail design industry, so she understands the importance of light when it comes to creating a comfortable atmosphere in your living space.